Click on the small Machine Series image below to obtain additional details. Now click on one of the logos on the right for a brochure PDF, YouTube video, etc. of that specific model series. To change model series click on another small image below. 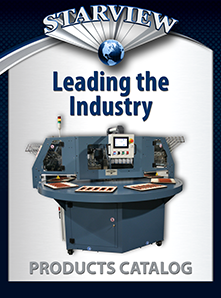 Starview’s FASP Series eight-station automated rotary Stretch Pak machines are ideal for high volume production. These machines are capable of up to 16 cycles per minute in production with a generous maximum card size of 16 x 18”. The Automated Stretch Pak machines are built with the capability to feed cards, form cavities, fold over cards, RF seal cards using a revolutionary solid-state generator. Finished cards are then unloaded, the film is heat shrunk to the products and finally slit into finished packages. 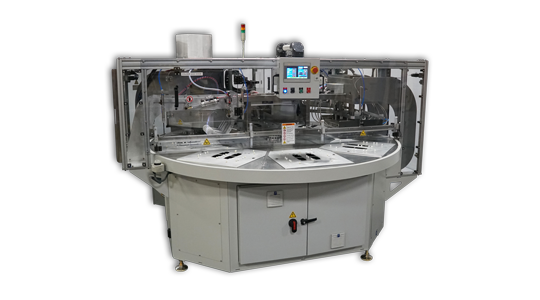 The FASP Series Stretch Pak machines will operate using PVC or Surlyn windowed cards.